Tired of endlessly spraying for flies? Order your Fly Predators™ brand beneficial insects now so you can put them out before the weather turns warm again. Just after the last hard frost is optimum. If you start on time, you can prevent flies from ever starting to build up. Then by releasing additional Fly Predators on a monthly basis throughout the spring and summer months, you can keep the pest fly population suppressed to the point they're never any sort of nuisance. Fly Predators are the original method of fly control. They are nature's enemy of all common manure and rotting organic matter breeding pest flies, including the common house fly, horn fly, biting stable fly, and lesser house fly. In the natural environment, Fly Predators help control pest fly populations by destroying the next generation of flies in their immature pupa (cocoon) stage. Most locations normally have some of the species in Fly Predators already, but unless supplemented regularly, they cannot provide the nearly total fly suppression people prefer. 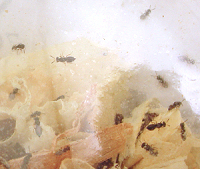 Fly Predators are tiny, completely biteless, and stingless. They never become a pest themselves. After they've emerged, their only goal is to reproduce by finding pest fly pupa. Because of their small size and the fact they live their entire life cycle on or near manure (where the pest fly pupae typically found), Fly Predators go virtually unnoticed. Any location where flies breed in manure or decaying organic matter can benefit from using Fly Predators. Because flies reproduce nine times faster than Fly Predators do, adding supplemental Fly Predators every three to four weeks during warm months keeps the population balanced for good fly control. If you release enough Fly Predators, they can control all the fly reproduction in the area. Effectively, you are treating your farm and kennel for flies instead of treating your animals. Nothing could be easier. Just sprinkle Fly Predators out of their sealed see-through shipping pouch near all locations where there is or was dog poop and other pest fly breeding areas. With kennels this is often the drainage areas, with a backyard dog it's where they do their business. In a few minutes you've done your fly control for the month. Fly Predators ship in the immature stage, inside a pupa (cocoon) which looks like a black rice kernel. A few days after arrival they'll begin to emerge and that's when you release them. Fly Predators will not fly to, crawl on or otherwise bother you. 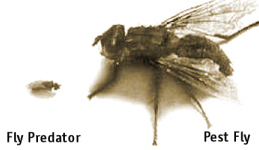 While Fly Predators stop pest flies from reproducing, they do not affect existing adult flies. You can't expect a fly free environment immediately following the first release if you start after flies are already present. Adult pest flies must either live out their short 21 day life span or be removed by supplemental methods of fly control compatible with Fly Predators. These include traps, sticky paper, or bait. Complete instructions as well as a handy guide to controlling flies and other pesky flying insects found around animals are included with your first shipment. Over the past decades we've found that these quantities of Fly Predators every three to four weeks provide excellent control for most dog situations. However, the number of Fly Predators needed varies not only with the number of dogs, but also the size and condition of the property, the weather, the severity of the existing fly problem, and the number of neighboring animals within a 1/4 mile radius if those locations have poor fly control. A pest fly can easily go 1/4 mile, sometimes much further. The best solution is to have everyone with animals within this distance use Fly Predators, so that no one will be bothered by flies. There are many neighborhood groups who order enough Fly Predators for all of their properties together. In the case of the grumpy neighbor that won't participate, buying a few extra Fly Predators for their animals often costs remarkably little more. Keep in mind that it is much easier to PREVENT a buildup of pest flies than it is to get rid of them once they have multiplied to intolerable levels. It's best to start when the daytime highs reach 60 degrees F. This is BEFORE the first flies begin to appear. Then continue with Fly Predator shipments every three to four weeks stopping a month before the temperature drops down into the low 60's. If you start after the pest flies have built up to high levels, an initial shipment of two to three times the normal Fly Predator quantity will be needed to get control of the pest fly population as quickly as possible. From the standpoint of fly control, the goal of good manure management is to minimize the available suitable breeding area. Flies need a moist medium to successfully reproduce, so removing all dog poop quickly helps. If it can't be removed, putting it on a composting pile raises the temperature of all but the outer few inches too high for fly larva. For the same reason, if you've had much more rain than normal, then additional Fly Predators may be required for a few shipments. Our recommended quantities assume a reasonable job of kennel waste management. If it's poor then more Fly Predators will be needed, but control is usually possible. 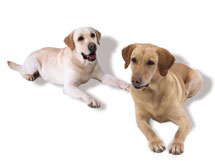 For dogs that are ranging over many acres or for severe fly problem situations, additional quantities likely will be needed. Fly Predators are what biologists call parasitoids. That is, they are classified somewhere between predators and parasites. Like parasites, Fly Predators are much smaller than their pest fly host. However, the effect the Fly Predators have on the pest fly's population is exactly like a predator in that the Fly Predators kill the immature pest flies. Technically Fly Predators are tiny Hymenopteran insects of the Pteromalidae family, a family that contains many of the worlds beneficial insects. These are pupal parasitoids as they attack the pest fly's pupa stage (the cocoon that houses the pest fly during its metamorphosis from larva to full-sized adult). Fly Predators are sometimes referred to as parasitic wasps, but unlike other Hymenopteran insects, such as bees, wasps and ants, Fly Predators are completely biteless and stingless. Currently the mixture of species marketed under the trade name Fly Predators include: Spalangia cameroni, Muscidifurax zaraptor, Trichomalopsis, Muscidifurax raptorellus and at times insignificant quantities of other fly parasitoid species. This balanced mix of multiple strains and guaranteed yield from the most advanced quality control techniques means you can always count on the best results with Spalding Fly Predators. Fly Predators never become a pest themselves. Being passive insects, they do not crawl all over you when being handled, nor will they migrate into living quarters as pest flies do. Since Fly Predators live their entire life cycle on or near the surface of manure and other decaying organic matter, and because they are so small in size, they go virtually unnoticed. When they are released near fly breeding sites, the female Fly Predator searches through the area seeking out the fly's pupa. After locating one, she drills a hole in the pupal case, inserts her ovipositor, and deposits from one to a dozen eggs inside. After her eggs are deposited, she obtains nourishment by ingesting the fluids of the developing pest fly. The female Fly Predator then moves on and repeats the process until all her eggs have been deposited. The Fly Predator's eggs that were deposited inside the pest fly pupa will develop into mature adults within 14 to 28 days. The pest fly larva is consumed as a source of food by the developing Fly Predators. Immediately upon emergence the Fly Predators mate and start the cycle all over again. The life span of the female Fly Predator ranges from as little as two weeks to as long as one month. She will live just long enough to deposit all of her 50 to 100 eggs. When the pest fly's population is under control and only a few pest fly hosts are available, the female Fly Predator has the ability to reabsorb her eggs as a source of nourishment and thus is able to live up to a month while searching for pest fly pupae. Fly Predators occur worldwide and in natural situations they are a major factor in the control of pest flies. However, where man has congregated domestic animals the presence of Fly Predators is often diminished. One reason for this is that Fly Predators have not developed the immunity to pesticides that the pest fly has. One single application of pesticide or even the residue from previous pesticide treatments can completely eradicate the Fly Predators. The release of additional Fly Predators will help re-establish these native beneficials. As there is no known method of fly control that offers 100% eradication of pest flies, Fly Predators do not totally eliminate the fly problem, they minimize it. Also, Fly Predators usually only disperse themselves 150 feet from where they have emerged, whereas pest flies migrate much farther, which means there will always be some pest flies coming in from neighboring uncontrolled breeding areas. If you are tired of nasty flies around your kennel constantly bothering your dogs and causing health problems, and would love to avoid the ear biting, spraying, swatting, fly days of summer, then consider a great natural solution -- Spalding Fly Predators. Typically you need 300 Fly Predators per dog every three to four weeks during warm months. With a cost ranging from $3.00 to under $2.00 per thousand, depending on shipment quantity with a minimum of 5,000, the cost per animal is minimal while the resulting benefits are substantial. Often times, Fly Predators will actually cost less than your past fly control efforts! Order 5 monthly shipments and we will double the quantity of Fly Predators in one of those shipments for free. Order nine months and receive two bonus months. Twice as many Fly Predators working for you helps insure control during the worst fly months. When you receive your Fly Predators be sure to keep them out of reach of your dog until you are ready to release them. They are harmless to your dog, but dogs love the smell of them and will shred the package if you give them the chance. For best results you should start before the flies get bad, just as the weather starts to turn warm. It takes just a few minutes to sprinkle Fly Predators out of the bag they come in on your dog poop areas and any areas that are constantly wet. Just getting them close to these fly breeding areas is good enough, as they self distribute up to 100 feet away. Then, continue to release Fly Predators monthly through the summer and you'll keep the fly population under control. The tiny Fly Predators are the natural enemy of flies, but never bother people or animals. Unlike pesticide sprays that only affect adult flies, Fly Predators target the pest fly pupa (cocoon) stage, killing the immature flies before they can bother you and your animals and preventing them from reproducing. Many people say they hardly see a fly all season, and all without the use of any potentially harmful pesticides!